Be careful, she will take you to the nearest autoBAhN ! RoA World Tournament is Pay 2 win . Imagine people coming with a 5 mil hammer coming to destroy WW. Anyway it only can be a good idea due to travian need for money since last finals. 621-200 ≠ 500, must be sth else. DACIA decided to delete even from the first ROLLBACK and we did delete over 60% of the accounts and we will do it again. It's not about winning or not it's about fair game. After 2 min Dealer: OK, not start betting everyone. What is the points to continue when everyone know what others have? we had 60kk on the World Wonder with lvl 30 and not a single hammer coming toward us. So let me tell you something regarding this, it's call STRATEGY , playing your 1 % chance of winning , your cards the best you can, bluffing even if you don't have nothing. Now you can focus on a question : How come a meta like Dacia with around 750-800 accounts can have 60kk deff on the wonder ( not counting the one guarding the plan and 3x artefact ) and a meta like Italy with 1200 in NE + Bom , Dogma , FC and other friends they send in the NW area ( counting more then 1600 account ) have 60-65kk deff on the wonder. Good luck and for the future try using your brain before you post something. Gold purchased after 22 February will not be reimbursed? After the incompetence shown by Tg we must also suffer the theft gold bought after 22 February? Gold bought after 22/02 should be returned at 100% since after the rollback there will a be a time hole between 22/02 and 06/03. Take a screen so you can show the gold you bought after 22 feb if it's not returned to you as it should be. But you will not get +50% on the gold you bought after 22 feb. If you think uollas is worst than you why you don't try to be better than them ? It's because you can't ? i think, he was referring to the use of FF by someone..
Yeah but no, they were multiple threads and post before this one showing the issue. Luca73 and his friends started to write here (in this thread) when the bug on UollasWW appeared, before that noone was here (doing senseless post btw). I don't believe in coincidence, do you ? Laughing at the 8k ppl (not only uollas to be clear) whom have lost time and money on these finals? Kinda sad, don't you think ? The player in question founded among the last in our confederate and despite this, he demanded a 15 grains with 150% oasis. You can already see there's something wrong. In any case he decided to found in an area that went beyond our expertise and began to attack all his allies in its vicinity (Turks) because he did not want players near his capital. He was kicked out after almost 3 weeks and I don't know after how many alerts, even his sharers apologized to us for his behavior. It's not italian, they stole it from french ! If you keep refreshing you see def die, but if you don't refresh.... you'll never know. Schrödinger seal of approval ! Instead wasting last hammers on WW, we could go and zero Kim. DM me if you want to do a whole server op, like Ciccio_Shady_IT could say WE ARE GONNA WRITE HISTORY ! Yes, as you can see from the Natar's profile. The only issue about waiting for Natars, is they currently don't hold one, unless there is a special one kept in reserve, this could actually roll on for months and months, better to draw lots and allocate a winner, have them accept they win by default, stop any attacks on the "victor" and push res to them from everyone. Be finished in a matter of days, equally a large loss of income. Oh 🅱️oi, what about their cap ? Roll back damages everyone even more because they did not ask meta leaders for a FAIR and ADEQUATE restart date and time, they f.ked up everything (forgive me for the inadequate vocabulary) and entire meta STRATEGY, not just ours. I would have done if I had been invited to Munich..
You have been there last year. 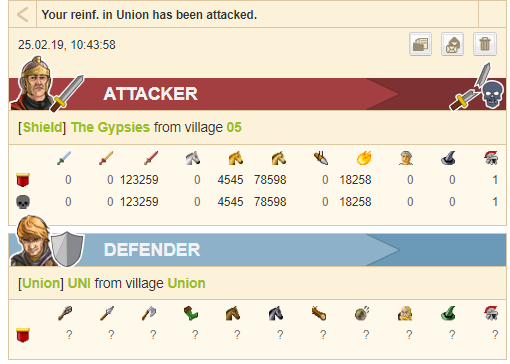 You destroyed NPC villages on 24/02/2019 19:00:00. Even with the roll back, villages are destroyed.